I heard this prayer on k-love radio this morning.. and I really felt compelled to share it. You can either listen to the prayer said by JD Chandler- one of the k-love radio DJs.. here or you can read it below. Whatever you choose to do.. make sure you let each word sink in. Turn off any music playing..or the TV.. shut the door of your office or your bedroom.. remove all distractions and really let these words resonate in your heart. May this not only be the prayer you say today.. but the prayer you say everyday for the rest of your life. Because in that place I can’t help but worship you. So without going into too much detail… I have a friend (yes, I actually do have real life friends that aren’t furry creatures).. that is going through a pretty difficult time. His marriage is on the rocks and he’s struggling to find any hope. Without prying too much, I asked him how he was doing and talked with him briefly about the entire situation. And at the end of the conversation, I wanted to be able to offer him some kind of hope.. some way for him to see even the teensy amount of light at the end of the tunnel. Well, no such luck. Dont’cha hate that? You want to offer the person some kind of uplifting advice and you go blank, you ain’t got nothing.. nada. zip. xelch. You get the idea. So, before getting off the phone with him, I simply said… “well, is there anything I can do?” (As if I could wave some magical wand and make everything better..) He politely declined (because after all, he knew my magical tank of power was empty). And so I said something to the effect of.. “Well, I’ll be praying for you and everything.” Yeah.. and everything. That’s pretty much what I said. It’s only because I felt awkward saying it. I mean.. I’ve said it before- like a zillion times, but I’m not sure I’ve ever said it to someone without knowing whether they even believed in God. It was kinda one of those- “oh crap, I hope he’s not buddhist or atheist.. well, even they need praying so.. well, crap…either way, it’s too late now” moments. Ever had one of those? Yeah, probably not.. I’m sure I’m the only crazy person who thinks like that. A lot of clients are clueless about what to wear for family portraits. So if you’re one of those people, you’re not alone. Here is a little bit of insight on what I think works for family photos. Gone are the days of wearing black and khaki or white t-shirts and jeans. While they are a classic look, they also remind me of photo sessions from J.C. Penney. We’ve all been guilty of doing it, but let’s not make the same mistake again. The only time I’d recommend black and khaki is for newborn shots. Nothing looks better than a cute little bundle of joy up next to black shirts. The contrast is beautiful. However, with family photos- times are changing and it’s time to have fun with your clothing. While we want everyone to complement each other, being too “matchy-matchy” is a bit extreme. Layer, layer, layer. Not only do layers and texture look great in a photo, but that gives you options to differentiate photos. Adding a blazer or a scarf to an outfit makes it look more complete and helps you pop out from your backgrounds. By the end of the shoot, you can take off some of the layers and you’ll end up looking like you have on a completely new outfit! a way to give back to our military. The winning family will receive a photography package valued at over $250! I, Kristina Kerns, will serve as your photographer for up to 3 hours at one or two locations of your choice. A Disc of 100+ fully edited High Resolution Images and the shared right to print release form. An Online Gallery that you can share with friends and order prints, wrapped canvases and photo albums. Any family with a member in the military (husband, wife, or child needs to be an active member of the military or part of the military reserve), of any branch of service. Please do not compromise any security concerns by disclosing specific deployment locations/missions. Please submit all entries for consideration by Friday, October 21st. 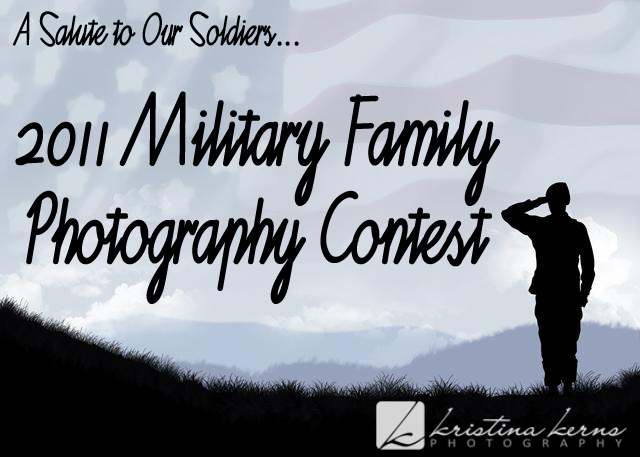 All valid submissions of eligible families will be posted in an album on the Kristina Kerns Photography facebook page with the post titled “2011 Military Family Submissions.” It’s going to be up to you to vote for the winner! Do you know a military family that deserves a free photoshoot? Please share this link with them! I wish I could give free photoshoots to all the families out there serving our country, but obviously I can’t. However, I hope this inspires all of you to give back in some way (big or small) to say thank to all those who are fighting for our freedom and to give back during this upcoming holiday season. If you don’t know already, I’m a photographer. It’s my passion and when I’m behind the lens, I find the most joy. I’ve been taking photos for years.. from when I shot film back in high school (and probably even before that..) to now. However, I’ve recently started my own business – a leap of faith to say the least. And you can learn more about my business and see some of my recent work at www.kristinakerns.com. And this brings me to another point… I’ve decided to tie my blog to my business and I’ve done this for one main reason. I have nothing to hide about my faith. It’s who I am and it seems obvious to me that I should tie my passion with my faith. Many people will say this is a huge business mistake, but if incorporating my faith into my business will turn off some clients- then those are probably not the clients I want to be serving. So on my blog- I’ll be mixing up my posts. Some will be about my faith, my family and scripture I’ve found interesting and others will be about photography – tips of the trade and ideas for photoshoots. I’m definitely no expert about any of the things I write, but I want to be able to share about the things that are most important in my life. Maybe you’ll learn something new.. or maybe you’ll just learn a little more about me. Either way, this is my new direction (yes, I totally stole that from Glee) and I hope you’ll like it.